Although I love pastry, sometimes it can be too heavy, so I thought of making this pie using potatoes at the bottom as well as on top instead of lining it with pastry. Boil the potatoes for about 8-10 minutes, drain and leave to cool. Sauté the onion, celery and carrot over medium heat until softened, add the mushrooms and garlic, cook for a few minutes more and then add the wine. Add a tsp of gluten free chicken stock powder. If too dry, add a little water. Throw in the chopped rotisserie chicken, followed by the panna. Season with salt and pepper, nutmeg and tarragon. Stir in the parmesan cheese and freshly chopped parsley and take the pan off the heat. By now the potatoes would have cooled down. Put a little olive oil in a freezer bag, and season with salt & pepper. Slice the potatoes thinly, and place in the bag to coat in olive oil, moving them around gently with your fingers to so they will not break. If some break, you can use these at the bottom of your dish. Keep the best for the top layer. Layer half of the sliced potatoes at the bottom of your dish. Pour over the chicken and mushroom mixture and level. Place a few mozzarella slices on top of the mix and then layer the remaining potatoes decoratively on top. Place a few pats of butter on the potatoes and sprinkle with extra Parmesan Cheese and a grinding of pepper. Place in the oven and bake until the potatoes are ready and turned golden. Sprinkle with a little parsley on top before serving. 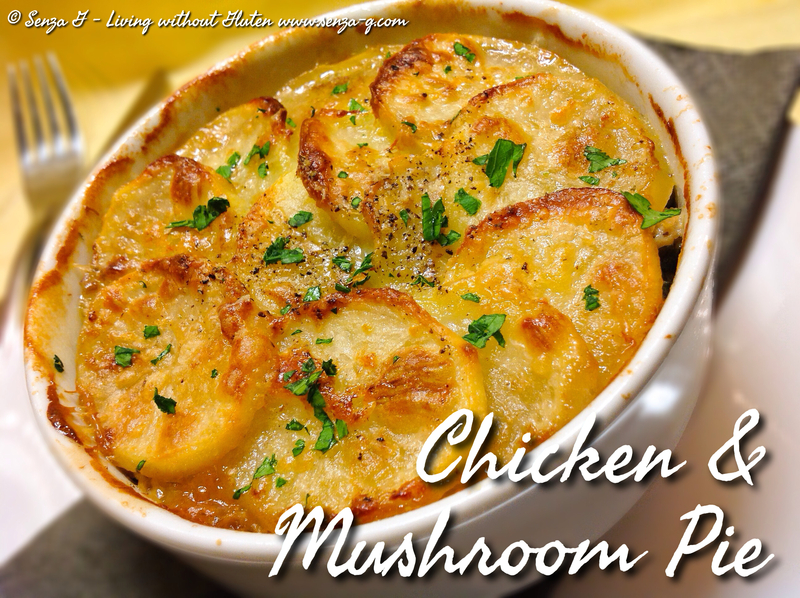 * If you do not have leftover chicken and wish to use fresh chicken breast, you can chop it and then add it to the pan before you add the mushrooms.